A meat Thermometer or Cooking Thermometer is a thermometer used to measure the internal temperature of meat, especially roasts and steaks, and other cooked foods. 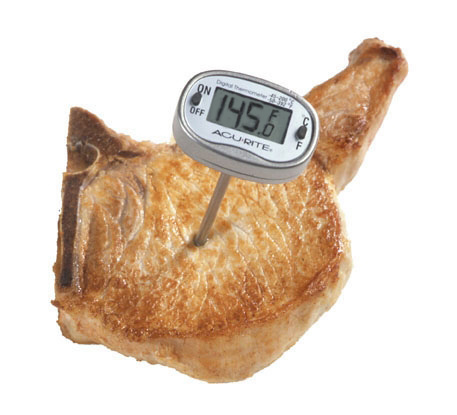 The degree of "doneness" of meat or bread correlates closely with the internal temperature, so that a thermometer reading indicates when it is cooked as desired. When cooking, food should always be cooked so that the interior reaches a temperature sufficient, that in the case of meat is enough to kill pathogens that may cause foodborne illness or, in the case of bread, that is done baking; the thermometer helps to ensure this. Looking for ideal COOKING THERMOMETER Manufacturer & supplier ? We have a wide selection at great prices to help you get creative. All the MEA THERMOMETER are quality guaranteed. We are China Origin Factory of Digital Thermometer. If you have any question, please feel free to contact us.